We have CE and standard forklift ramps on the market. Why do Dubai Dry Docks, USAF, Naboodah & more than 125 companies trust our ramp? Standard Ramps are made for low frequency container where there is less loading traffic . It is affordable compared to Xtreme Ramps. The steel structure is made to do the job and is lighter compared to Xtreme ramp. They are widely used in Gulf and MENA regions. We also sell Xtreme version of our CE certified ramps. They are used for high frequency loading/unloading where productivity and speed are paramount. CE Stands for Conformation of "European Conformity"& conforms to health, safety, and environmental protection standards for products sold within the European Economic Area (EEA). These ramps have best in class and have better safety and other features compared to standard ramps. Click here to view Xtreme ramps. 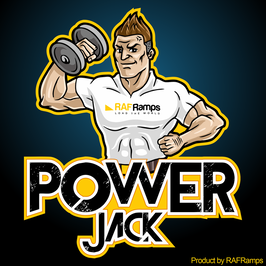 Read "How to Choose Forklift Ramp"
Power Jack is our proprietary system released after 2 years of research and perfection. It incorporates best of the two world and has both manual and electric options of operating the jack for faster loading and unloading of the goods and materials. Manufactured with high quality parts and materials which are durable and long lasting. Please view the video below for more information on how it operates. L- shaped loading is when head unit moves so container can be loaded from front on 20 feet container. Read more about it here . An additional small ramp accessory is required to achieve this. Your vehicles needs to be restrained when loading unloading, using wheel chocks can help to restraint the vehicle and prevent accidental movement. We test the forklift ramp with maximum weight above the Safe Working Load (S.W.L) which is certified by Third Party Load Testing company. We are one of the few companies to physically load test each ramp with live load. The Third Party Load Testing company is Dubai Municipality approved and the test is valid for one year. We have optional hydraulic fully automated control both jack types and for center axle type. If you have high frequency and large number of containers more than 80 container per month, it would be better to go either with Powerjack or Hydraulic forklift ramp. Optional forklift solid wheels can be used to move the ramp if you are using the ramp in muddy environment. Do you want you ramp to be maintained after the warranty period? Contact our sales consultant for more information. ​Subscribe to our mailing list to get the updates to your email inbox!